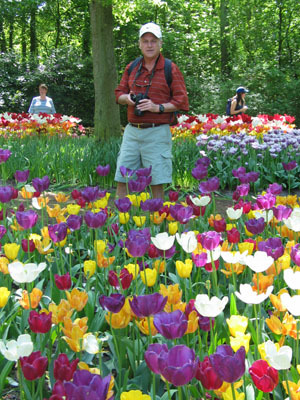 Incredible masses of pink, purple, red, orange, white, and multi-colored tulips swayed in the spring breeze as we walked paths around Holland’s Keukenhof Gardens. Flowers with petals large and small, smooth and ruffled provided an imspiring variety blooms—more than I could ever have imagined. 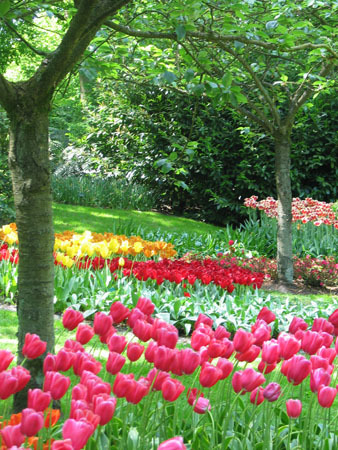 If you haven’t seen Keukenhof Gardens, you haven’t seen what The Netherlands is famous for. Gorgeous tulips in a canvas of colors, yellow and white daffodils, purple hyacinths and other spring bulbs stand out among massive pink azaleas. 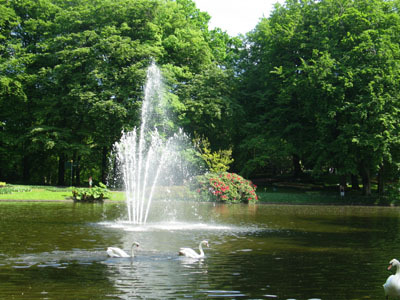 Multiple ponds, some with fountain spouts dancing skyward, are scattered throughout the grounds. Currently owned and operated by a foundation, Keukenhof’s first open air flower exhibition was held in 1949. This expanded to an annual event that draws visitors from all over the world. The theme for 2013 is “United Kingdom—Land of Great Gardens,” which honors the abundant inspiration garnered from gardens in the UK. There’s a special exhibition on English gardens and a spectacular flower mosaic of Big Ben and Tower Bridge. On Saturday April 20, 2013 hundreds of thousands of spectators will line the roadside for glimpses of the annual Flower Parade traveling along its 40-km route from Noordwijk to Haarlem. The procession will include 20 large floats and more than 30 decorated luxury cars, interspersed with plenty of music. Another parade (free of charge) with illuminated floats takes place in the evening on Friday, April 19 in Noordwijkerhout. Located in Lisse, Keukenhof is the largest bulb garden in the world. You can bike from Amsterdam or The Hague, take a bus, or drive. Tours are also a popular option. 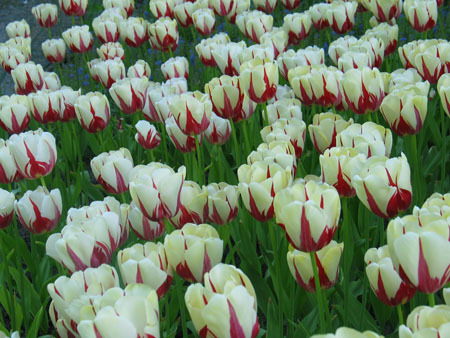 Along the way, you’ll pass numerous fields filled with tulips—a lovely preview of the bright floral displays awaiting visitors to Keukenhof Gardens. 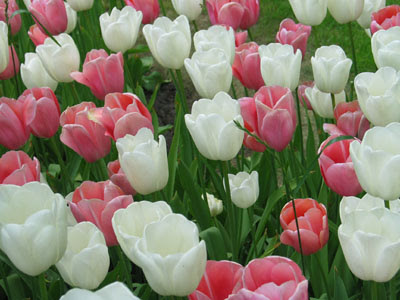 The renowned annual tulip festival runs from late March through early May with the best time to see everything in full bloom in late April. Of course, this is also prime tourist time, so expect the park to be extremely busy the last two weekends of April. 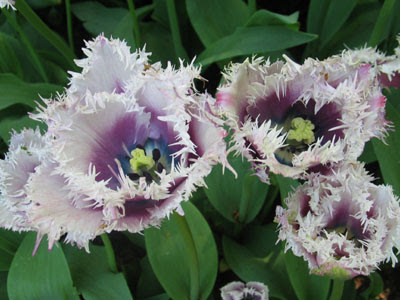 Even though we visited the first week of May, near the end of tulip season, it seemed like none of the seven million hand-planted bulbs was missing. You can get a guide book or take a tour of the park aided by a rented headset with information on each of the gardens, but we decided to wing it and wander leisurely through the sumptuous scenes. This worked well because we stopped so often to photograph large landscaped beds and striking individual flowers. Plan at least three hours to five hours to make your way around as much of the 10.5 miles of footpaths as possible. You can bring a picnic lunch (Larry and I ate cheese, bread, and fruit that we brought along) or purchase food from restaurants and snack vendors. In addition to over 100 varieties of tulips, the park features 2,500 trees of 87 varieties and the largest sculpture garden in The Netherlands. Featured sights are the mosaic gardens, Japanese garden and inspiration garden as well as daffodil and hyacinth bulbs in planters. Take time to stop and watch swans swimming in the lake and costumed dancers performing traditional jigs.